Disney Channel is all in on Big City Greens. Recently, the network announced they’ve ordered a second season of the upcoming TV show. Big City Greens debuts on Disney Channel on June 18th at 9:30 a.m. ET/PT. 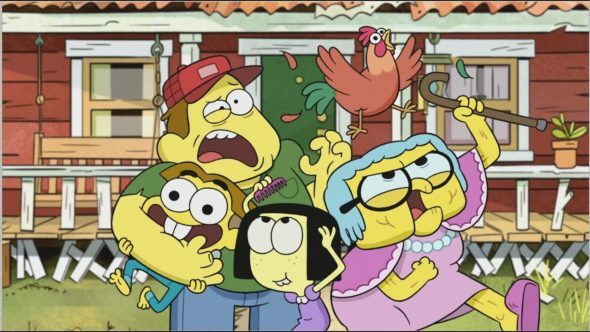 Disney Channel has ordered a second season of animated comedy-adventure series “Big City Greens,” about a mischievous and optimistic country boy who moves to the big city with his wildly out of place family, ahead of its series debut, MONDAY, JUNE 18 (9:30 a.m. EDT/PDT), on Disney Channel, DisneyNOW and Disney Channel VOD. The series hails from comic book creators and brothers Chris and Shane Houghton (“Harvey Beaks”) and influenced by their childhood growing up in the small rural town of St. Johns, Michigan, with many of the locations and characters inspired by their real-life family members and townsfolk. The series premieres with a week of new episodes rolling out daily, Monday, June 18 – Friday, June 22, as part of Disney Channel’s GO! Summer that super-serves kids and families all season with new programming. Following the debut week, new episodes will premiere throughout the summer on Monday and Wednesday mornings (10:00-10:30 a.m. EDT/PDT). “Big City Greens” shorts will begin rolling out Saturday, June 16, on Disney Channel and Disney Channel YouTube. Coinciding with the series premiere, the DisneyNOW app will also unveil its first multi-player game “Big City Battle!,” where players compete against each other to earn their place as members of the Green family. “Big City Greens” follows the offbeat adventures of 10-year-old Cricket Green, whose natural curiosity and enthusiasm lead him and his family – older sister Tilly, father Bill and Gramma Alice – on epic journeys and into the hearts of his new neighbors. The voice cast is Chris Houghton as Cricket Green, Artemis Pebdani (ABC’s “Scandal”) as sweet Gramma Alice, Marieve Herington (“How I Met Your Mother”) as quirky older sister Tilly Green and Bob Joles (“Puss in Boots”) as hard-working father Bill Green. The guest voice cast includes Emmy® Award-winner Jon Hamm (“Mad Men”) as store manager Louis; Emmy Award-nominated Raven-Symoné (“Raven’s Home”) as news reporter Maria Media; GRAMMY® Award-nominated Busta Rhymes as a wise fish; Danny Trejo (“Spy Kids”) as bodyguard Vasquez; Academy Award® winner Jim Rash (“The Descendants,” “Community”) as waiter Ted; Paul F. Tompkins (“Bajillion Dollar Propertie$”) and Lauren Lapkus (“Orange Is the New Black”) as city hipsters Justin and Val; Andy Daly (“Silicon Valley”) as Officer Keys; Scott Aukerman (“Comedy Bang! Bang!”) as a radio DJ; Griffin McElroy (“My Brother, My Brother and Me”) as a pepper merchant; Paul Scheer (ABC’s “Fresh Off the Boat”) as supermarket manager Chip Whistler; Zeno Robinson (Marvel’s “Spider-Man”) as Cricket’s best friend, Remy; Lorraine Toussaint (“Orange Is the New Black”) as Remy’s mom; Colton Dunn (NBC’s “Superstore”) as Remy’s dad; and Anna Akana (“Youth & Consequences”) as café barista, Gloria. What do you think? Are you a fan of Disney’s animated series? Will you watch Big City Greens? More about: Big City Greens, Big City Greens: canceled or renewed?, Disney Channel TV shows: canceled or renewed?